From poor project outcomes and a miserable customer experience to a predictable process with real-time transparency, instant collaboration and unprecedented control. More than half of all capital projects end up behind schedule and over budget. Despite the many improvements in project management technology and methodologies, project owners still feel out of control because they have no transparency into what is going on. This unpredictability raises risk unnecessarily. The status quo of poor outcomes and customer expectations has been accepted decades, with the clients, project vendors and technology providers all complacent in the existing state of affairs. But things are changing. More and more, many clients are asking for more insight into the project process, fixed fees and timelines and other mechanisms to mitigate risks and regain control. Not much has been done in the last 30 years to rectify the situation. Incremental changes in technology from the large enterprise application vendors as well as the project management software providers have done nothing to improve on these bigger problems. Project Business Automation offers unprecedented capabilities that enable you to bound light years ahead of your competition. 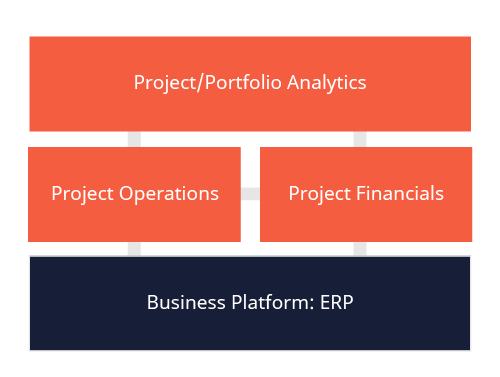 By elevating the the focus from the lower level functions of project management and project financials to the higher level concept of the entire project business, Project Business Automation is able to address the fundamental problems that cause the poor project outcomes and dismal customer experience. In the end, delivering exceptional outcomes and a great experience for your customer is good for business. What is your reason to consider PBA? Project Business Automation changes the paradigm. There are no more excuses for the status quo. Project-driven companies can no longer afford to continue with disparate systems and disjointed processes that yield dismal results and keep you and your customers in the dark. With the ability to update your stakeholders and customers in real time on the state of your projects, the choice is to adopt, evolve and radically improve your clients’ experience, or remain complacent with the old way. Learn how these companies are transforming their business and delighting their clients. Northrop Grumman is a $25 billion defense contractor with operations all over the world. It needed to streamline its project processes in its international subsidiaries while ensuring accurate and timely data flow to US management. KPMG Switzerland lacked real-time insight into project performance, which put the company at risk. It searched the market for one integrated solution that could deliver financial, human resource and project management together. After thorough evaluations, it chose ADEACA + Microsoft to deliver on this promise. APi Group, a multi-billion-dollar specialty contractor construction firm, uses ADEACA to standardize business processes across its portfolio of subsidiaries, providing real-time insights to executives to help make better, more timely decisions. View other success stories here.